Paw Points is a reward program associated with Fresh Step cat litter. 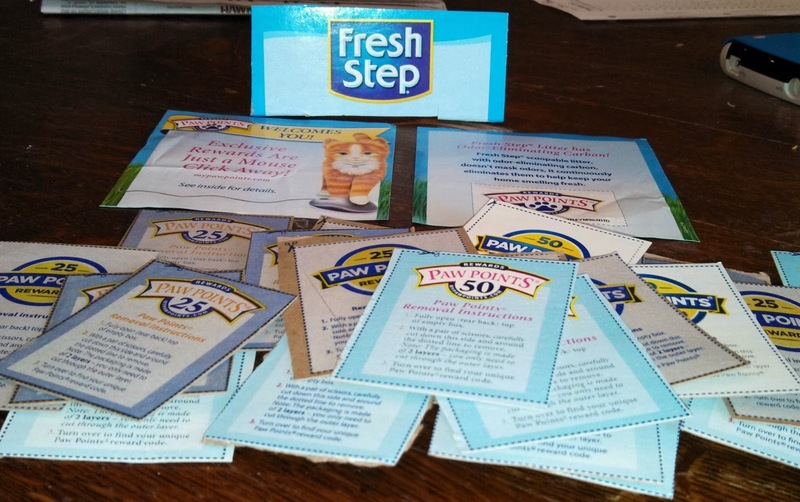 When you buy a package of Fresh Step cat litter, the box may contain a coupon you can cut out that has a Paw Points code printed on the back. 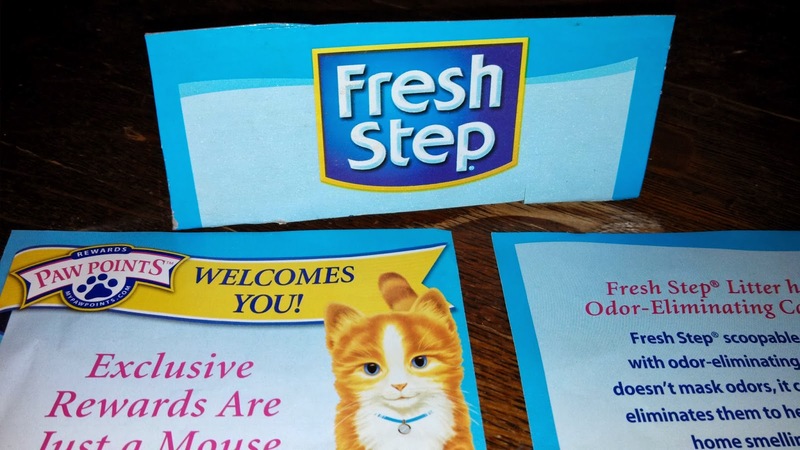 Some packages of Fresh Step have a plastic envelope inside that contains the Paw Points coupon. Don't throw this away- you can get free stuff if you save your Paw Points. 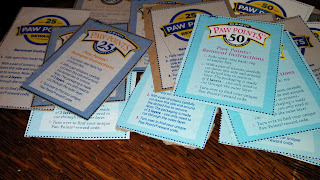 The large boxes of cat litter typically have a 50 Paw Points coupon, and smaller boxes have a coupon for 25 Paw Points. I have also seen 45 point denominations. The Paw Points codes can be entered at the Fresh Step website. You can use Paw Points to get prizes and discounts on future cat litter purchases. I have collected thousands of Paw Points! What Rewards and Free Stuff Can You Get with Paw Points? Automatic Litterbox Bargain from Amazon! How Do You Get Paw Points? You can find Paw Points on cardboard Fresh Step packaging. It has a dotted line printed around the certificate- cut this out with scissors. On the back, there is a Paw Points code that you can enter at the Fresh Step website to register your Pwaw Points. You can also look through the rewards catalog and decide how to spend your Paw Points. How Much Are Paw Points Worth? You can't exchange Paw Points for cash, but you can use Paw Points to get savings on cat liter. For example, you can get a $3 off coupon for 325 Paw Points. This puts the value of Paw Points at about $1 for 100 Paw Points. So Paw Points are worth about 1 cent each. You can purchase Paw Points on eBay. Some people end up with Paw Points codes and have no use for them. Do Cat Claw Caps Work? Are Claw Caps a Good Alternative to Declawing? Dog Cookies? Can You Really Get Cookies For Dogs? Dog cookies are dog treats that look like cookies. 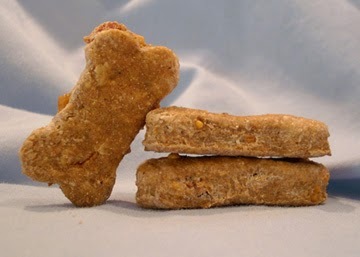 Most dog treats look like they are made for dogs- they are brown colored and shaped like a dog bone. Some dog treats are tube-shaped and filled with meat flavored filling- obviously not something that would be confused with a cookie. 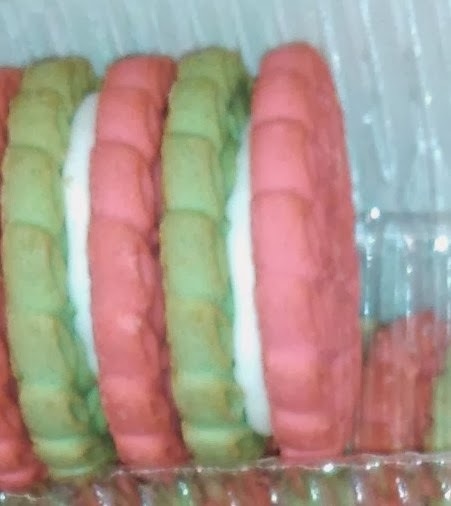 But some dog cookies look just like real cookies. Dog Cookies at the Pet Shop- I would eat something that looks like this! What is the Difference Between Dog Cookies and Regular Cookies? The ingredients are the main difference between dog cookies and regular cookies. 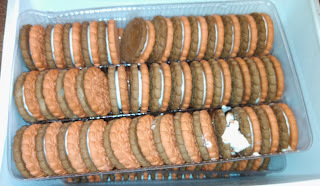 Dog cookies do not contain chocolate because chocolate is harmful to dogs. Sugar and corn syrup is also not included in dog cookies- these ingredients are bad for a dog's teeth since dogs do not brush and floss their teeth like people. There are varieties of dog cookies that are gluten free for dogs that are sensitive to wheat products. You can also buy or make vegetarian dog cookies that use flavorings like peanut butter or sweet potato instead of beef or chicken. 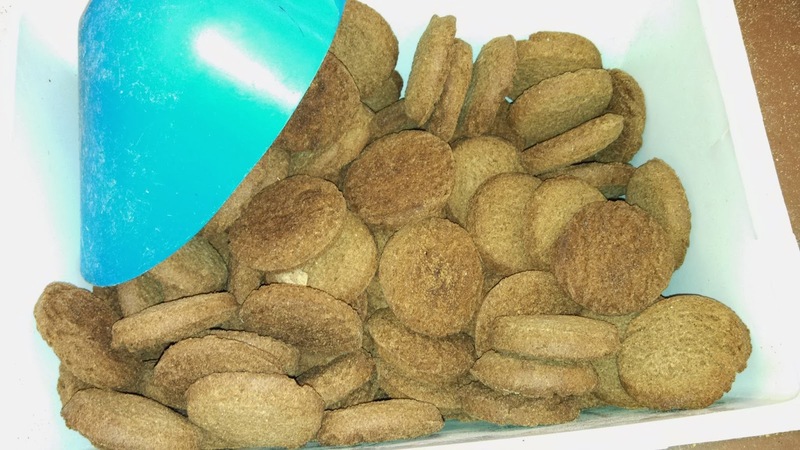 Tray of Dog Cookies- these look like real cookies! What is in Dog Cookies? The base of most dog cookies is eggs and flour. Dog cookies may also contain oat and rice ingredients such as oatmeal or rice flour. Flavoring for dog cookies may include peanut butter, beef broth, chicken broth, or other flavors that dogs like. My first impression when seeing the dog cookies at the pet store was that dog cookies are ridiculous. Do we really need dog treats that look like cookies? Do dogs care what their treats look like? But after further thought, I realized that dog cookies serve mostly to make humans happy. 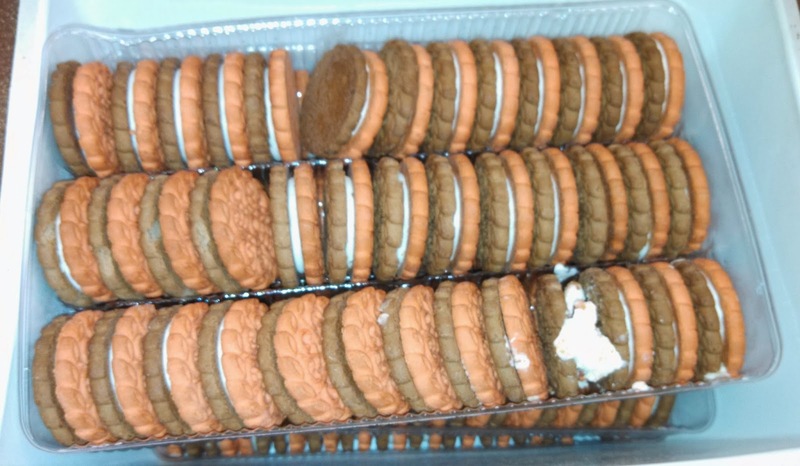 People have fun giving their dog treats that look like real cookies. This is sort of like giving your dog a collar with a cool design- the dog doesn't care what their collar looks like, but giving the dog a stylish collar makes the owner happy. 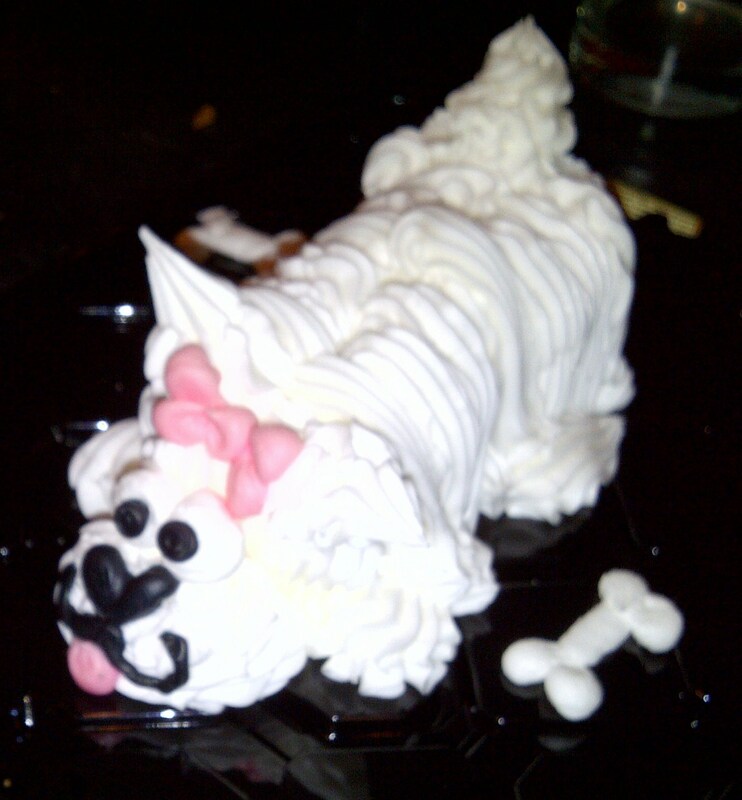 I think dogs would enjoy treats of any shape or design. If making dog treats that look like cookies makes people happy, then why not? Pet Food: Why is dog food and cat food so expensive? Would it be cheaper to feed my pet meat? Mutt Mitt Dog Waste Bags vs Plastic Bags: What is the Best Way to Pick Up Dog Waste? I first encountered Mutt Mitts when walking in a city park. There was a sign encouraging dog owners to pick up after their pets. Next to this sign, there was a dispenser for dog waste bags. The type of dog waste bag being dispensed was Mutt Mitt. I didn't have a dog with me, but this sounded interesting enough that I took a Mutt Mitt to try out later. Mutt Mitts are made of biodegradable materials and break down within a year, unlike regular plastic bags. 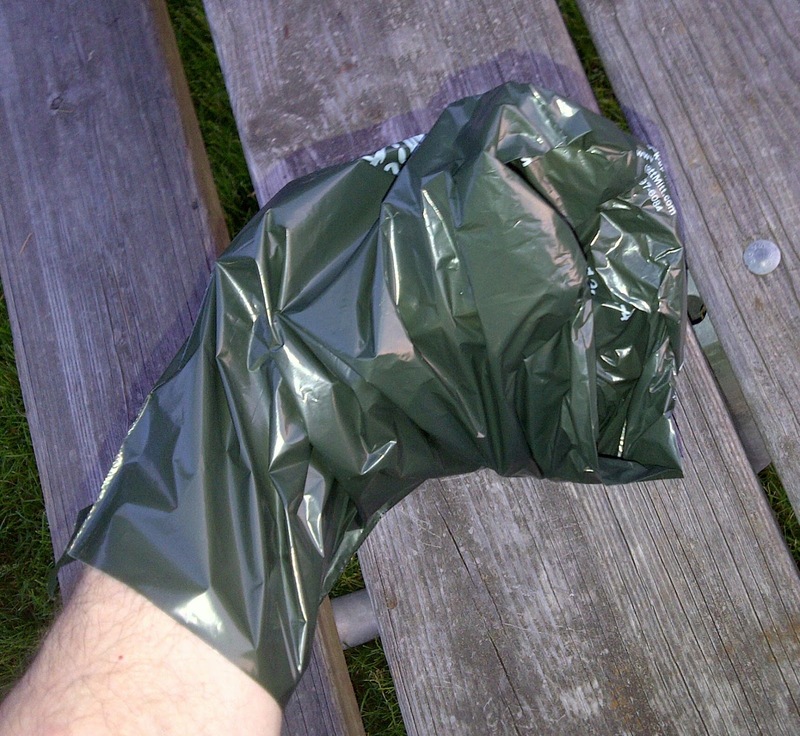 The shape of Mutt Mitts is much better than a rectangular plastic bag for picking dog waste. The Mutt Mitt is shaped so that your hand can easily pick up the dog waste by grabbing it from both sides. 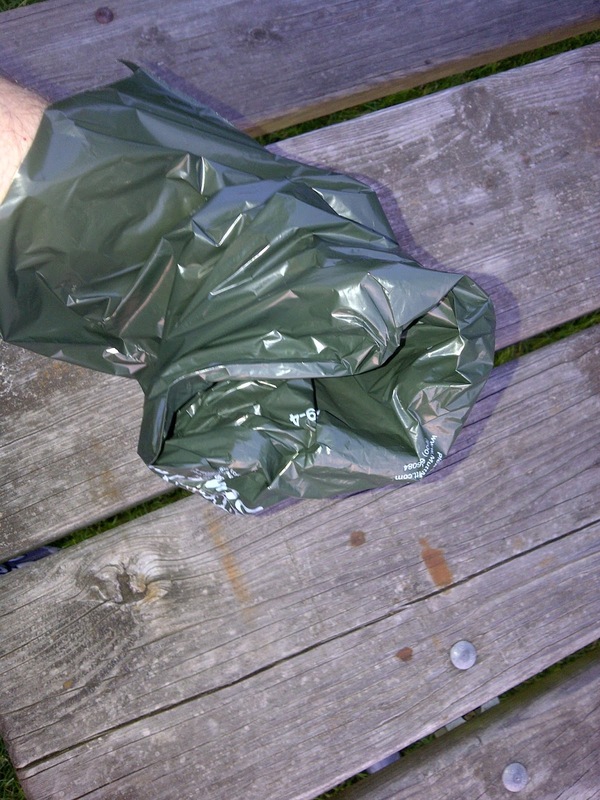 You then turn the Mutt Mitt inside-out so that the dog poop is contained neatly inside for easy disposal. The Mutt Mitt I picked up at the park was constructed with 1-ply plastic. 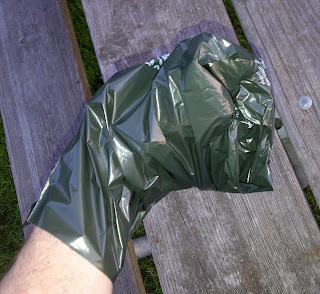 You can also get 2-ply Mutt Mitts that provide more isolation than thin single ply plastic bags. This means that it feels less like you are touching dog poop, which can be a good thing. How Much Do Mutt Mitts Cost? Of course the Mutt Mitt I picked up at the park was free. If you want your own supply of Mutt Mitts, they cost about 10 to 20 cents each, depending on the quantity you order. You can get less expensive single ply Mutt Mitts (called Singles). 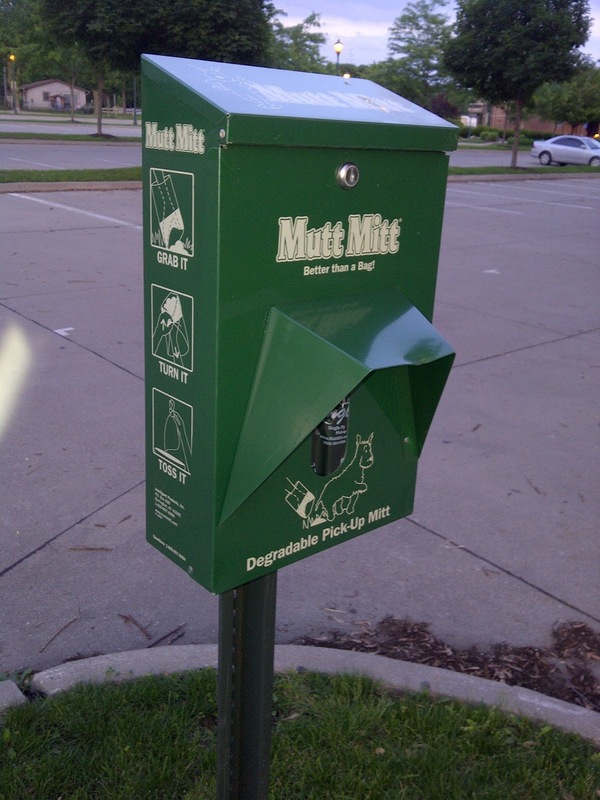 Organizations like cities and park departments, dog parks, and campgrounds can order dispensers, signs, and bulk supplies of Mutt Mitts. The most popular option for picking up dog waste seems to be rolls of small plastic bags. The plain ones cost about 3 cents per bag. 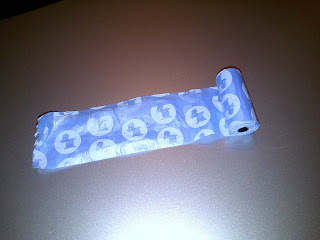 I find the bags that come on rolls are difficult to dispense and open, especially in really cold weather. I can remember a number of times standing in a snow storm trying to get a dog poop bag open. The sides stick together, and when the bags and your hands are cold, it is sometimes almost impossible to open the bag. Sometimes I rip the bag a little bit to get it started- and sometimes this ruins the bag. 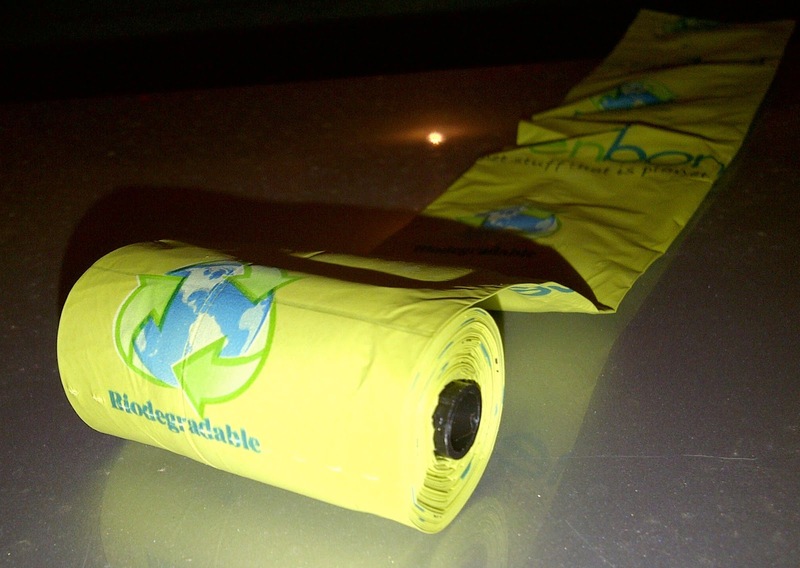 You can get biodegradable dog waste bags on rolls for about 5 cents per bag. Greenbone Biobase Pet Waste Bags come on rolls like the cheap plastic bags, but they are much easier to open and are thicker. High quality biodegradable dog waste bags are better choice all around than the cheap plastic dog waste bags that come on rolls. They work better than the cheap plastic bags, and they are biodegradable just like your dog's waste. Another option for plastic bags for dog waste disposal is reusing plastic bags that you get for other purposes. I find that Subway sandwich bags work great- they are the right size and the plastic is strong enough for the job. Newspaper bags also work well. Our newspaper comes in a small plastic bag on rainy days- I always save these for dog duty. 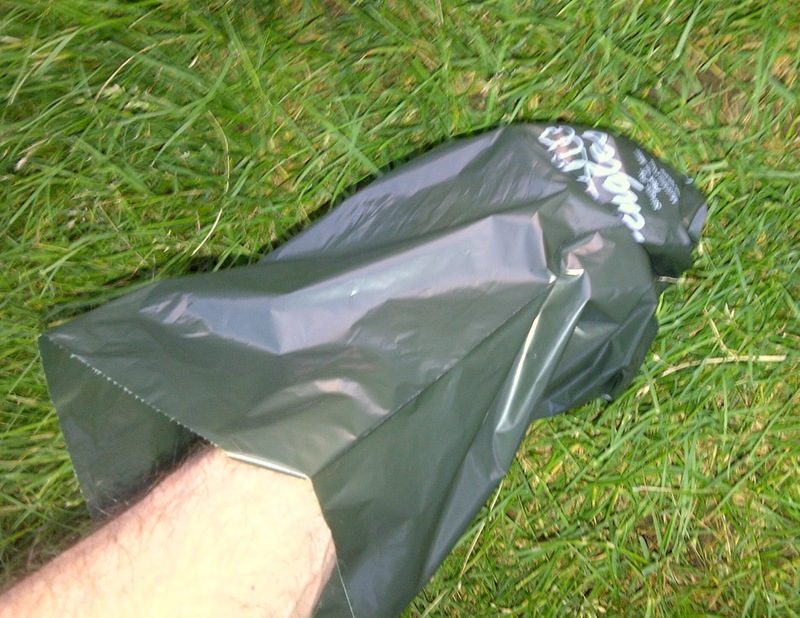 You can also use plastic shopping bags to pick up dog waste. I don’t like to use shopping bags- they are too big. They take up a lot of room in your pocket, and there is a lot of wasted plastic since the bag is much larger than necessary. Also, the cheaper shopping bags tend to have small rips and holes- this is not desirable for a dog waste bag! Pet Food: Why is dog food and cat food so expensive? Can You Really Buy Dog Sunglasses? Yes, you can buy high quality sunglasses for your dog for under $25. These sunglasses are designed especially for dogs and typically have two adjustable straps- one that goes under the chin and another that goes around the back of the head under the ears. Dog sunglasses provide UV protection for dog's eyes similar to the protection provided by sunglasses for people. This can be important for dogs that spend a lot of time outside, especially in environments where your dog is exposed to lots of reflected light: boating on the water, on the beach, or in snow on a sunny day. This style of dog sunglasses looks like human sunglasses with straps added. Some styles of dog sunglasses are more like goggles than glasses. They remind me of swim goggles with an extra strap. The goggle style dog sunglasses provide protection from blowing sand, dust, and other debris in addition to UV protection. 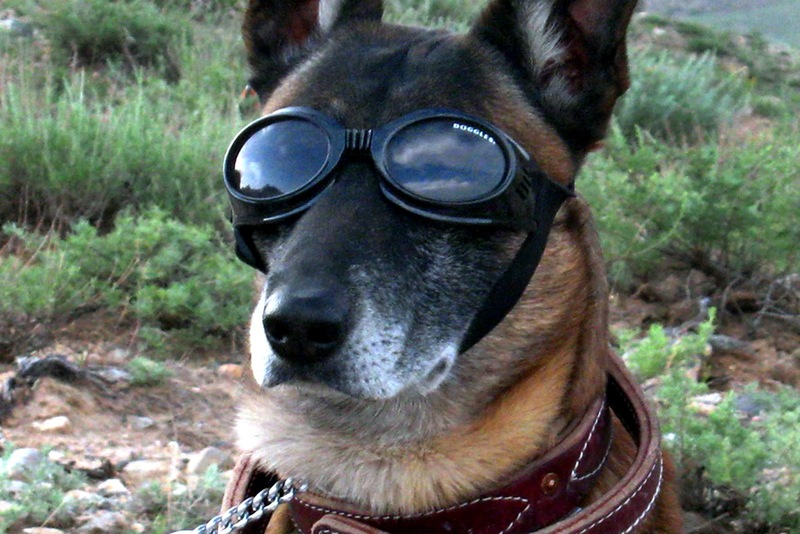 Military dogs use the goggle style of dog sunglasses when working in environments with eye irritants. Some dog owners put dog goggles on their dog during car rides so the dog can put his head out the window. 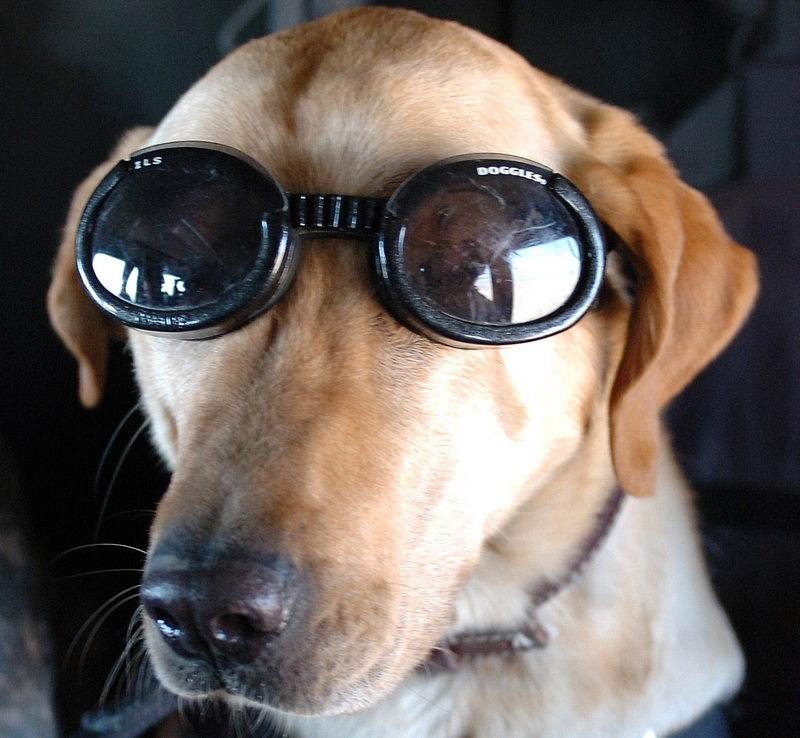 The goggles protect the dog's eyes from drying out and from blowing debris. Some dogs have medical conditions that make their eyes more sensitive to sunlight. German Shepherds and some other breeds are susceptible to an eye condition called Pannus which is caused by UV light exposure. 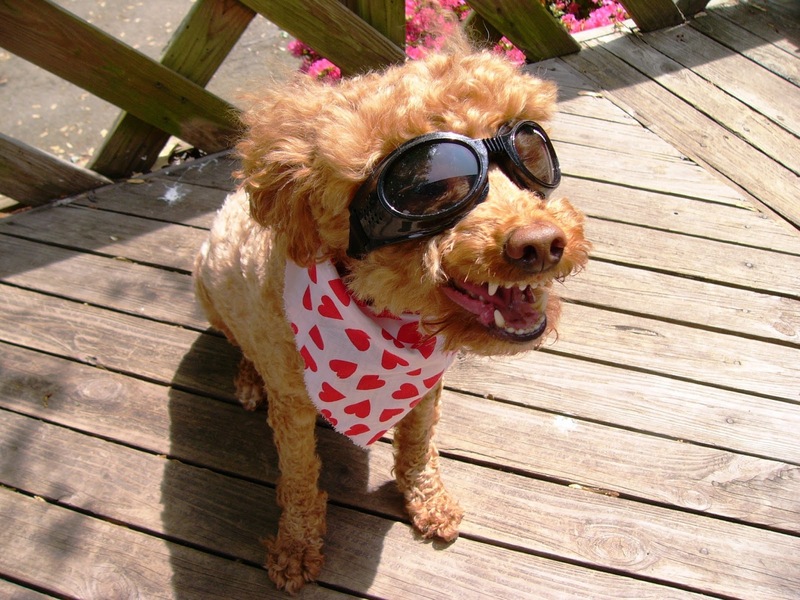 Dog sunglasses are helpful for dogs with Pannus that will spend a lot of time outdoors. As dogs age, their iris muscle may become weaker, which reduces the ability to constrict and reduce the amount of light entering the eye. Dog sunglasses are useful for older dogs that have sensitivity to bright light. Dog sunglasses may help prevent cataracts in dogs. Do you prefer goggle style or sunglasses style? Goggle style dog sunglasses provide excellent UV protection as well as protection from blowing debris. The sunglasses style looks like human sunglasses and may be more fashionable while still providing UV protection for you dog. Doggles K9 Optix is a sunglasses style while Doggles ILS and Doggles Originalz are the goggles style of sunglasses. This dog seems to enjoy wearing sunglasses! Some models of dog sunglasses, such as Doggles ILS (interchangeable lens system) allow you to change the lenses to a different color of tint, or even clear lenses for nighttime use. You can also get black lenses that block 100% of light for blind dogs. UV protection- This is the main function of sunglasses! Shatter-proof lenses- You don't want the lens to break and injure your dog's eye. Anti-scratch Lenses- Dogs may put a lot of wear and tear on lenses during normal use. Anti-Fog lenses- Especially important for goggle style. Lens spacing from eye- The sunglasses lens should have space for your dog's eye. Some breeds have protruding eyes that bulge out. My Malshi (Maltese - Shih-Tzu hybrid) has eyes like this. You'll want to choose a style that has enough room so that the sunglasses will not contact the dog's eye. Doggles is the leading brand of dog sunglasses. Styles include both sunglasses style (Doggles K9 Optix ) and goggles styles (Doggles ILS and Doggles Originalz ). The U.S. military uses Doggles for their service dogs. Doggie Shades sells the sunglasses style of dog sunglasses. This company has been in the dog sunglasses business 18 years. They have a sizing chart on their website where you can print out a paper template to check sizes. Available wholesale and from sellers on eBay. These look to be an inexpensive goggle style of dog sunglasses. With some practice, it takes about 15 seconds to put dog sunglasses on your dog. The first time, you'll need to adjust the straps to the correct fit. It is recommended to put the sunglasses on your dog outside, especially the first few times. If you put sunglasses on inside, you dog may be confused by darkness since there will not be enough light to see well. The video below shows how to put dog sunglasses on your dog in 15 seconds. To determine ideal back strap and frame length, measure the entire head circumference, across the eyes and around under the ears. To size chin strap, start just under one ear, under the chin, and back up to under the other ear (like a helmet strap). Allergens are the agents that cause allergic reactions. The primary allergens produced by dogs that affect people are dander and saliva. Dander is composed of skin cell that slough off as new skin cells are produced. Saliva is produced by the tongue and is transferred to the dog’s fur by licking. As fur sheds, dander and saliva from the dog are carried to come into contact with people. 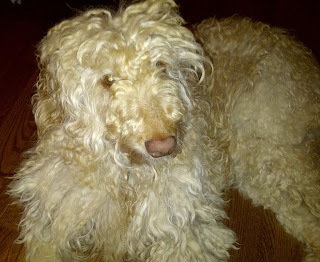 Hypoallergenic dogs shed less and therefore are thought to produce less allergic reaction. Since all dogs produce dander and saliva, all dogs have the potential to cause allergic reactions. This dog is hypoallergenic! What other choices are available? Which Dog Breeds are Hypoallergenic? Some dog breeds are known as hypoallergenic. These breeds shed less fur than others. The lists below contain dog breeds that are known to shed less than most. Small dogs have less surface area, and therefore produce less dander. Another advantage of small dogs is that they are easier to groom and bathe frequently, which will reduce the amount of dander and saliva that they carry. Dogs also can pick up pollen outdoors and carry it in their fur, causing allergy problems in addition allergies related to the dog itself. Frequent bathing can reduce the amount of pollen that dogs carry in their fur as well and may reduce allergic reaction. Since there is variability in dander and saliva characteristics and amount of shedding among individual dogs, it seems like a good idea to spend time with the particular dog to gauge the amount of allergic reaction to expect. Hypoallergenic Cats: Which cat breeds are least irritating? Why is Pet Food so Expensive? Why does pet food cost so much? Would it be less expensive to just feed pets meat and vegetables? Is dog food and cat food a good deal, or could you make your own pet food for less? We'll check the cost of popular pet food brands per pound vs. the cost of meat and other pet food ingredients per pound. There was a minor catastrophe last night. The cats ran out of food. Cats get annoying when they are really hungry, so a late night trip to the grocery store was in order. I brought home a bag of Purina One Beyond for the cats and filled their bowls. However, they seemed unimpressed with my efforts. The next day, I went to Walmart to see if I could find a larger bag of cat food for a better price. (Target did not have this brand.) The bag from the grocery store was $8.48 for 3.5 pounds I even brought the bag with me so I could match the correct chicken flavor. The picture below shows the bag from the late night run to the grocery store on the left, and the larger bag on the right. Can you spot the problem? Two bags of cat food- can you spot the problem? 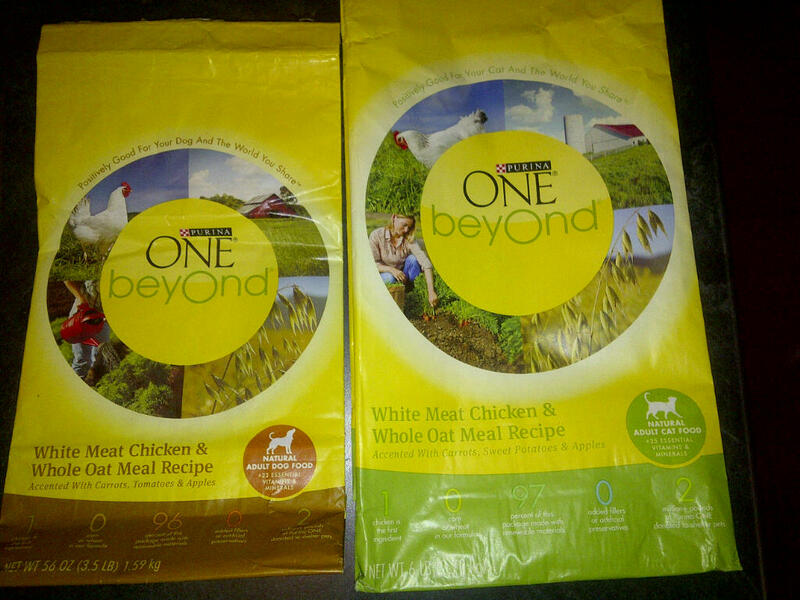 Both bags are Purina One Beyond. Both are chicken flavor. Look closely at the picture of the animal in the circle. The one on the left is DOG food! No wonder my cats wouldn't eat it... My dogs seem to like it, even though it's not their usual brand, so no harm done. At least the larger bag was cheaper- "only" $14.88 for 6 pounds. Did I really pay $14.88 for 6 pounds of cat food? Good grief, couldn't I just feed the cats real fish and chicken for this price? Of course there is a range of pet food quality and price, and Purina One Beyond must be near the top. The higher quality pet foods use meat and meat products as the main ingredients, the lower quality ones use corn and other grains as the main ingredients. I decided to see how much more the higher quality foods cost than the cheap stuff. Since I have both cats and dogs, I checked out cat food and dog food. I selected various sized bags of pet food of various quality. The tables below show the price per pound for popular dog food and cat food brands. The column with Weight indicates the size of the bag. Generic is the price winner for both dog food and cat food. The more expensive brands are about 3x more expensive than generic per pound in the same size bag. The size of the bag makes a big difference, the same food costs quite a bit less if you simply buy it in larger bags. Many of the lower cost "Name Brands" are not much more expensive than generic. I would bet that the ingredient list is similar as well. Why Don't I Just Feed My Pets Fish, Chicken, and Beef? Animal nutrition is a complex topic, I'll look at this from the cost angle here. I walked around the grocery store looking for food that I could conceivably use in pet food, especially cheaper meats. Dogs like peanut butter, so I thought peanuts would be a good ingredient. I hear rice mentioned as a pet food ingredient, so I'll use that as well. I wanted meat without bones- I wouldn't be willing to put too much work into making pet food. I wanted ingredients that don't require a lot of work. My question is: is it cheaper to buy pet food or would it be cheaper to feed them groceries. 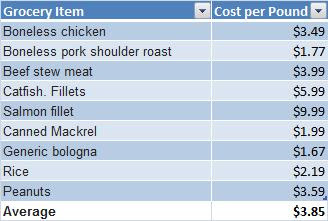 My grocery selections for pet food are in the table below, along with cost per pound. The bottom line of the table is the average for all of the items above. If you think pet food is expensive, buying groceries for your pets is much more expensive. Even the most inexpensive meat, like generic bologna, is more expensive than dog food or cat food if you buy larger bags. The average cost for my pet food formula: $3.85 per pound. High quality pet food sells for about $1.50 per pound. High quality pet food is a good deal for the money. You couldn't make something comparable without spending more than even the most expensive pet food. Pet food includes vitamins and minerals as well as the basic ingredients. Seeing that pet food is actually less than buying groceries for the pets makes me feel a little better. I think of dry pet food as "meat cereal". Pet food contains most of the things that cereal contains- grains, vitamins minerals, etc. If you consider the price of cereal, and then think of adding expensive ingredients like meat, it makes sense to me why pet food costs so much. You might ask why a penny pincher like me buys the most expensive brand of cat food at the store. Because my wife makes me. She thinks it's good for the cats, and she's probably right. I don't let my kids eat a lot of junk food, so I don't want to feed my pets junk food. They will be healthier and happier with a quality diet. Buy pet food in large bags to save money. The same food costs much more in smaller bags. Rather than buying cheap pet food to save money, feed your pet the right amount of higher quality food. Many pets are overweight, so save money and improve their health by feeding them less until they reach ideal weight. Cat Claw Caps: Are Cat Nail Caps a Good Alternative to Declawing? Labels: Frugal Living, Pets, Ways to Save Money, Why Are Things So Expensive?